I needed to buy some pink bar tape in a very particular shade that I may well have made up. As I couldn’t find it in any of the two bike shops I looked in, I decided that if there was a shop selling all kinds of made up bike dream items it would be near the station called ‘Velodromo’ which is a ride just east of the city and surely a mecca of bikeness. There is not much going on in this part of town. The velodrome has one of those serious testosterone muscle gyms inside and it isn't especially open to the public but if you walk all the way around you'll find the main entrance, find someone and you can totally Spanish your way in. If you look like you've cycled all the way from London and are the most excited you've ever been, this helps. This is what a stitched together image looks like when you leave Photoshop back in the UK. This velodrome was built especially for the 1968 Olympics. The kilometre time trial, match sprint, tandem match sprint, individual pursuit, and team pursuit were the five track events held here. The track is a seven metres wide, 333.33 metres long Schürmann design banked at 39 degrees. There is space for 6,400 spectators to get their Mexican waves on. It was originally made out of doussie alzeiba a strong African hardwood but was renovated to concrete in the 1990s. It's beautiful. At this velodrome in 1972, Eddy Merckx set the world one hour record at 49.431km which remained undefeated for 12 years. The Mexico City metro opened in 1969 a year after the Olympics. Here, all the metro stations have a logo for non-readers. Velodromo has a picture of a bike, obviously. There is another station called Niños Héroes which is named after six Mexican teenage military cadets who died defending Mexico in 1847's Battle of Chapultepec. 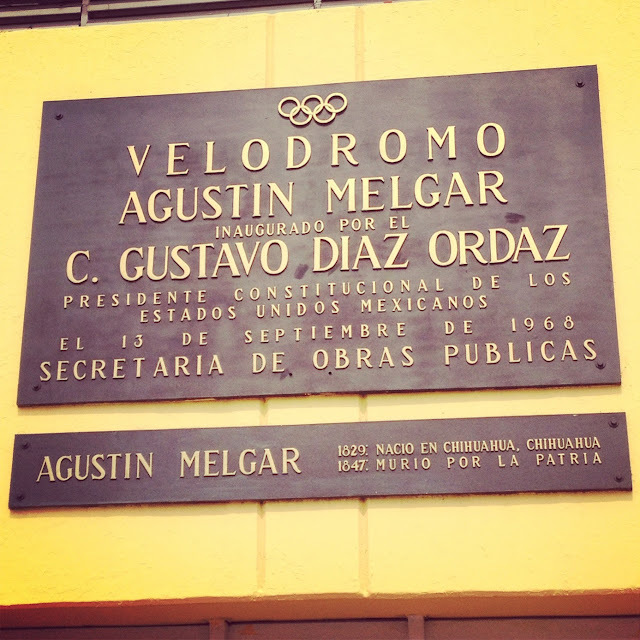 One of these young men was Agustín Melgar who this velodrome is named after. I'm so glad I didn't watch this before I went. 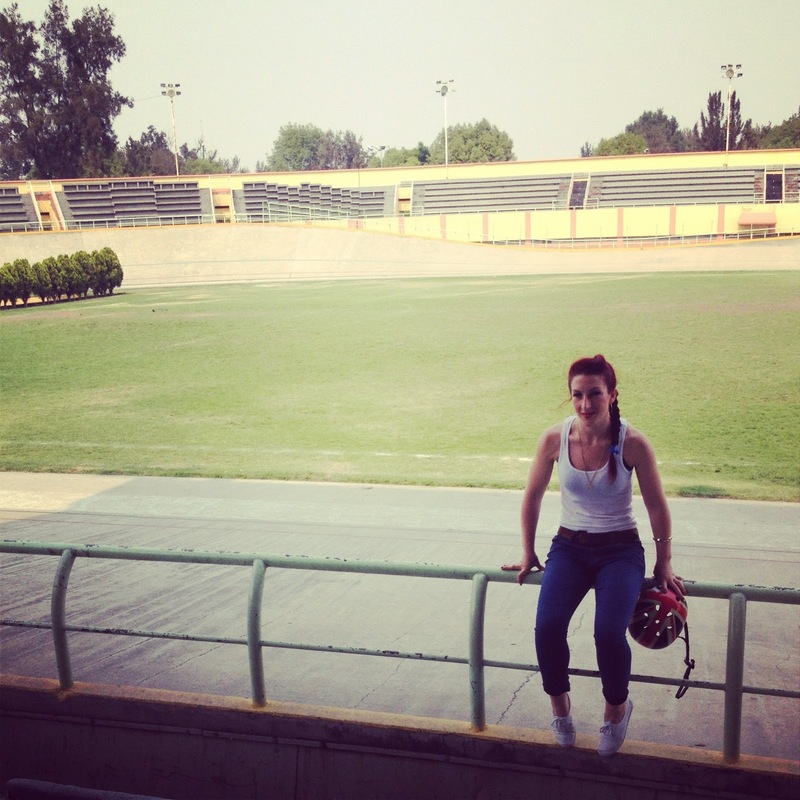 The velodrome was eerily deserted and that might just be the creepiest music ever. Although, many may prefer that tune to Vel-o-drome which I have have been repeating on a loop to the whole of Mexico in an equally creepy voice for oh about a week now. Good luck getting it out of your head. You're welcome. P.S. I still haven't found bar tape.